What does it take to start writing programs for Linux ? Most people will guess a text editor, knowledge of a programming language and the compiler and libraries of that language would suffice. But ask a professional programmer who has been writing code for Linux and he will differ with you and insist that while the three things stated above can very well help kick start ones programs, other things also come into play in writing efficient programs such as a debugger, memory profiler tools and above all a good understanding of the inner working of Linux kernel and its processes. 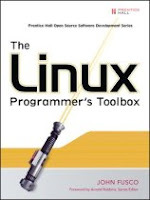 The book titled "The Linux Programmer's Toolbox" authored by John Fusco is a book which is a store house of knowledge which aims to make the average Linux/Windows programmer aware of the tools at his disposal which can help him write better programs for Linux. The book is divided into 10 distinct chapters with the first 4 chapters describing various ways of boosting ones productivity while embarking on writing code for Linux as well as getting to know the various tools at ones disposal. In the very first chapter titled "Downloading and Installing Open source tools", he talks about the different archive formats commonly used in Linux, various package managers such as Debian's own apt-get, Red Hat's Yum and how to properly authenticate the packages you download to ensure that they are not tampered. The second chapter deals with building tools from source. Here apart from describing the actual steps involved in compiling the sources, the author also delves into explaining the concept behind the MakeFile, the common variables used in implicit rules and so on. In this chapter one also gets to acquire an understanding of the tools used to create projects as well as examine how these tools work together in the build process. The book has a chapter exclusively devoted to explaining ways of ambulating through the myriad of documents; tools such as man, info, as well as some of the not so obvious ones. One thing I like about this particular chapter is how the author has provided tables which list a number of recommended manual pages with a short description of each of them. Linux doesn't have a comprehensive IDE on the lines of Microsoft Visual Studio to develop programs - at least not yet. Most Linux programming gurus are perfectly at home with coding using their favorite text editor. And any book of this stature will be incomplete without a mention of the different editors available for coding in Linux and their pros and cons. The 4th chapter of this book introduces the different editors including Vim and Emacs and discusses their pros and cons. There are numerous tips in this chapter which aims to make writing code much more efficient, productive and a pleasant experience for the average Linux programmer. As a Vi enthusiast, I couldn't help but admire how one can convert Vim editor to work as a code browser with the help of Ctags which is explained in detail. The fifth chapter titled "What every developer should know about the kernel" is a turning point in the book and gives a comprehensive understanding of the working of the Linux kernel. It is by far the largest chapter - with nearly 100 pages devoted to this topic - in this book. In this chapter the author talks in lucid detail about the different modes in Linux, the process scheduler, device drivers, the I/O scheduler and the memory management in user space, understanding all of which is instrumental in writing better programs for Linux. The next two chapters deal with Linux processes and the communication between processes. Here one gets to know more about the technical vagaries related to processes such as forking, cloning, process synchronization and the basics of inter process communication. The author has introduced several APIs and basic examples of each. In the 8th chapter, the author introduces many tools which are installed by default in most Linux distributions which aid in debugging communication between processes. The tools include (but are not limited to) lsof, fuser, stat, hexdump, strace and so on. And each tool is accompanied by its usage and its output with a short discussion of the output. In the 9th chapter titled "Performance Tuning", one gets to know more about fine tuning ones Linux program. Here the author explains the factors affecting system performance as well as the tools for finding system performance issues. Finally, the last chapter of this book explores some of the most common debugging tools and techniques for Linux. More specifically, I found the discussion on the use of GNU debugger quite informative. At the end of each of the 10 chapters in the book, the author has provided a short synopsis of the tools that are used. Also many additional online resources have also been listed where one can acquire more knowledge about the topic being covered. Through out the book, noteworthy sections have been highlighted in dark background which makes it quite eye catching and also easy for quick reference. The book is written with a slant towards the C language especially when depicting the examples in the latter half of the book. But that is something which can be understood considering that the bulk of the Linux kernel has been written using C language. Verdict : An excellent resource for those who are interested in improving their productivity as a Linux programmer. Most programmers with Windows background will be forced to make a paradigm shift while embarking to program for Linux. While the Windows programmers could take deceptive comfort within the cozy confines of a Visual IDE, when they make the shift to write Linux programs, they are suddenly faced with the hard facts of programming as it really is. And this book could be an ideal companion for this set of programmers who wish to lessen their learning curve and make programming for Linux a much more pleasurable experience. Having said that, I found this book to be an ideal companion for any programmer (not necessarily only of Windows background) who wish to develop programs for Linux. "Linux doesn't have a comprehensive IDE on the lines of Microsoft Visual Studio to develop programs...."
I would contend that Eclipse and the CDT with the standard gcc / g++ and gdb is very similar to Visual Studio. The claim that we pretty much have to remain in text editor land is simply not correct. True Linux has kdevelop, netbeans, eclipse yet al but if you want to learn to write good programs, there is no short cut to dirtying your hands by writing code. And IMHO most linux programmers still use an ordinary text editor to write code. I believe even many of the KDE developers use a standard text editor to develop KDE.